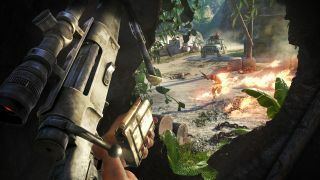 In today's new Far Cry 3 trailer, gravel-voiced Agent Huntley's safari in the totally safe Rook Islands introduces him to the local law enforcement as they banter and trade with villagers. Don't worry, it turns out pitching head-first into a murky pit with a cinder block tied around your neck is the utmost sign of respect in these parts. Who knew? Sampling the local flora carries its own special experiences, which might involve tripping out on psychedelics, stealing a bazooka out of a fortified bunker, and blowing up an APC while whistling "Liberty Bell" very loudly at the tiny elephants clinging to your belt. Or at least, things will float that probably shouldn't. The trailer also reveals multiple methods for acquiring firepower and plenty of soft bandit necks for your knife's delight - that is, if that weird doctor stops feeding you crazy magical plants. And here you were considering Disneyland for your vacation plans.